Team building even helps children in crisis. The Leader’s Institute® worked with L’Oreal Products, Inc. to contribute to the community and help needy children. 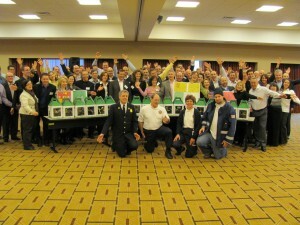 L’Oreal Products, Inc. decided to insure their team building event had an impact in the community. Working with The Leader’s Institute® they spent the afternoon of February 23, 2010 in a “Rescue Bear®” workshop. After the team building event, the result was eighteen high-quality stuffed animals complete with fire-fighter uniforms and accessories that were all donated to the local fire department in Florham County. 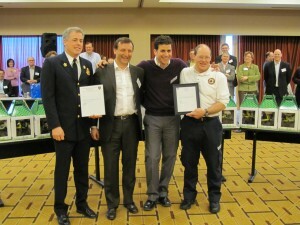 Fire Chief Jonathan Young, of the Florham County Fire Department, accepted the toys on behalf of the kids in his area. The Chief told of an incident the previous week where a seriously ill mother was being rushed to the hospital. Her six-year-old daughter was having to travel with her, since no one was available to watch her. As the mother suffered, the child became more and more upset. The paramedic had a stuffed bear, which he gave to the little girl. The child clung tightly to the bear and began to calm down. As the child settled, the mother’s condition also improved. Children in crisis need comfort. Sometimes in those moments a fluffy toy gives them something to connect with. The fascinating part is how the lessening of the child’s anxiety also helped the mother. Congratulations to L’Oreal Products for their contribution to the community through taking part in this team building event.